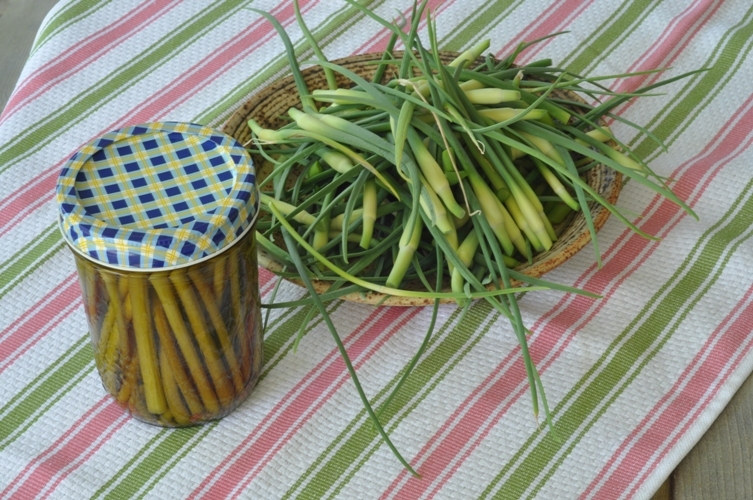 Pickled Garlic Scapes ~ An Overlooked Ingredient? Visiting other parts of the world always broadens your horizons. For example, the Vietnamese people do not waste a thing and they make all North Americans look like extremely picky eaters. While we might not be able to thoroughly enjoy grilled esophagus or chicken cartilage in the same manner they do we should try to utilize more of the food we grow. 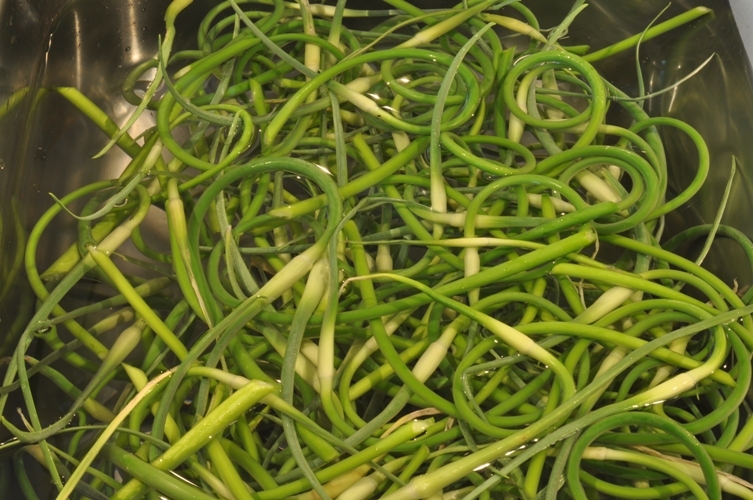 Garlic Scapes…this is apparently not a new thing to pickle but one you may have over looked. Although, we have not tried this before we are excited to give it a whirl and we will let you know how they end up tasting (in a month or so). We can only imagine they will rank up there with our pickled carrots and our oh so tasty dilly beans! Prepare for water bath canning. Sterilize jars in oven at 250F degrees for 30 minutes. 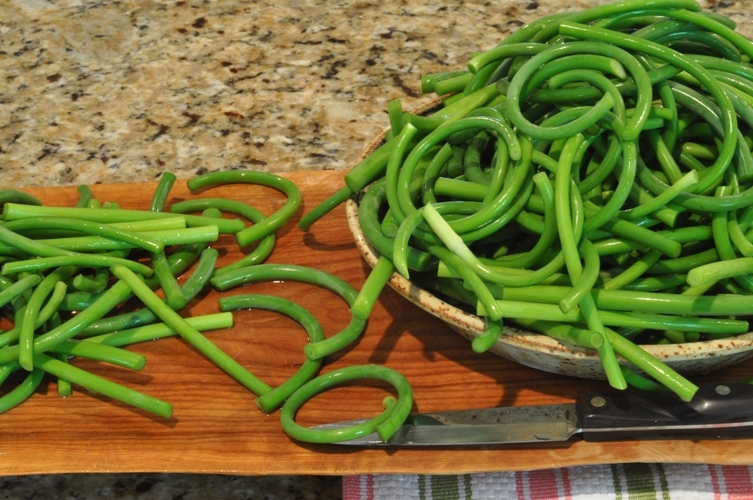 Rinse garlic scapes well and cut into 4″ lengths. Note: Use the bottom 8+” of the scapes ~curly bits included. In a stainless steel (or non-reactive saucepan) combine vinegar, water, and salt. Bring to a boil. Remove hot sterilized jars from the oven and add 1/2 tsp dill seed, 1/4 tsp black peppercorns, and 1/4 tsp red chili fakes to each jar. 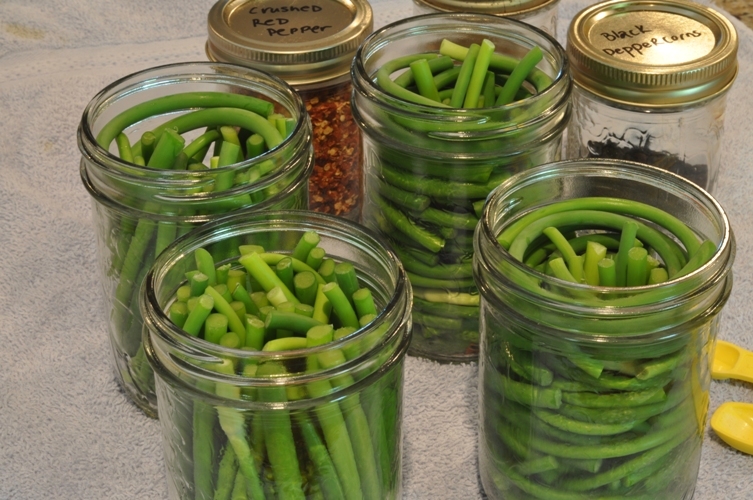 Tightly pack garlic scapes into jars. Ladle hot brine into each jar leaving 1/2″ headspace. Remove air bubbles, top up with brine (if necessary), wipe rims, center lids on jars, and tighten rings to finger tip tight. Process for 15 minutes in boiling hot water bath. Remove lid, let stand for 5 minutes, and remove jars to a folded towel. Let cool, check seals, label, and store in a cool space. Note: Pickled preserves are best opened after standing for a minimum of 2 weeks…but the longer the better! These tasty little gems are also delicious fresh grilled with a bit of oil (or butter) and salted to taste, or added in subsitute of onions to your morning omelette, or used to add flavor to a slow cooked pot roast. Let’s save the scapes as they are worthy of using in our everyday cooking as well as pickling to enjoy later in the season! I have an oh-so-silly question. Is there a difference between dill seed and dill weed? I can’t find dill seed in the grocery store, only dill weed. (I’m talking in the dried section.) If they aren’t the same, can weed be substituted for seed? Great question! In fact while we were in Florida visiting my family we couldn’t find dill seed in any stores anywhere…it just isn’t available. So, we now take some with us just in case the canning bug strikes. To answer your question ~ Yes, dill weed and dill seed are different. Dill weed are the dried leaves of the dill plant and dill seeds are the seeds from the flower head. The seeds are used as a spice because of their stronger flavour and are similar in taste to caraway seeds but more dilly. The flavour of both the weed and the seed diminish when dried so it’s always better to use the fresh herb (when available)…but the seeds are a great substitute ~ you will just need to use a liberal amount. I don’t think the dried dill weed will provide the same amount of flavour as the seeds. If you would like us to send you some dill seeds just email us at aturnbull9@sympatico.ca and we’d be happy to drop some in the post. I looked forward to having garlic scapes this year but our garlic didn’t produce any! However both our shallots and leeks were prolific with scapes and those were pickled and pestoed! This year I made salsa again (peach and pineapple!) and added the garlic scapes. Cross your fingers that it all works out! I discovered garlic scapes last summer, courtesy of my CSA. Try them on top of homemade pizza – nice texture, and a lovely mild garlic flavor. I just noticed all my garlic scapes the other day. I may have to try this! just finished pickling scapes after 10 years of growing garlic, i finally did something with them. yay for me! cant wait to try them out. thanks and what a great site! I heard you could pickle these but never tried it. Does it still taste garlicky after pickling? Yes, how was the taste? Were these worth doing? These turned out awesome. They have an interesting texture (not quite as crisp as the dilly beans) and the flavour is garlicy and fresh. Great served as a ‘fancy’ snack or added to a sandwich or cooked dish for a little zing. We would highly recommend making these. We hope to again this year…it will be a matter of timing for us! ive been eating them over the winter and they are amazing!if you have access to them you have to make them! o and i steamed mine first for a couple minutes to soften them up before you stuff them in the jars it made it easier and you can get more in each jar! I couldn’t agree more with utilizing the food we grow. We get a boat load of scapes every year from a friend who would otherwise be composting them.